Faith. Faith is so important to having a relationship in Jesus. After all, you can’t have a relationship with Jesus without having faith, right? Why? Because faith is having the assurance about what you don’t see. So becoming a Christian is having faith in Jesus, even when you can’t see him. But what happens after that? What happens when you accept Jesus but are now believing for something. Maybe, like myself, you are believing for babies. I currently have faith that I will become a mother even though nothing in the natural dictates that will happen. But that is where things get tricky. 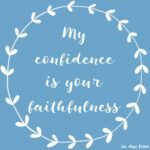 What am I putting my faith in? 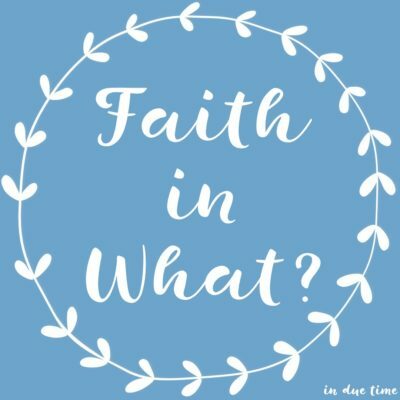 What are you putting your faith in? It’s so important to have faith, but you can have all the faith in the world and it be in the wrong thing. As you believe for a husband is your faith in the last date you had, the boyfriend you are currently with, the number of guys who are pursuing you or is it in God? As you believe for a baby is your faith in what the doctor’s have told you, the vitamins you are taking, the IVF procedure you are doing, your ovulation kit or is it in God? As you believe to be healed from your recent health diagnosis is your faith in the doctor’s report, the statistics on google, your symptoms and how you feel or is it in God? As you believe to make ends meet financially is your faith in your checking account, the job you are looking for or is it in God? As you believe for your marriage to be restored is your faith in your emotions, your own pride, the last thing your spouse said or is it in God? What or who is your faith in? Make sure it’s always in God. How do you know? Well do a heart check. What are you believing more? The seen? The facts? The reality? Or are you believe the Word? 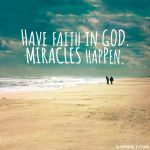 When you faith is in God, you won’t be rattled by the trials that come your way. You won’t doubt just because the doctors told you that you will have cancer forever, just because you are 40 and still not married or just because you got another negative pregnancy test. When you have faith in God, your faith isn’t dependent on your circumstances around you, it’s dependent on the very character of who God is. 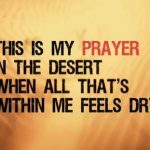 Put your hope, faith and trust in the One who has all the answers, who can change your impossible situation, who can answer your prayer and who can heal you from all sickness and disease. 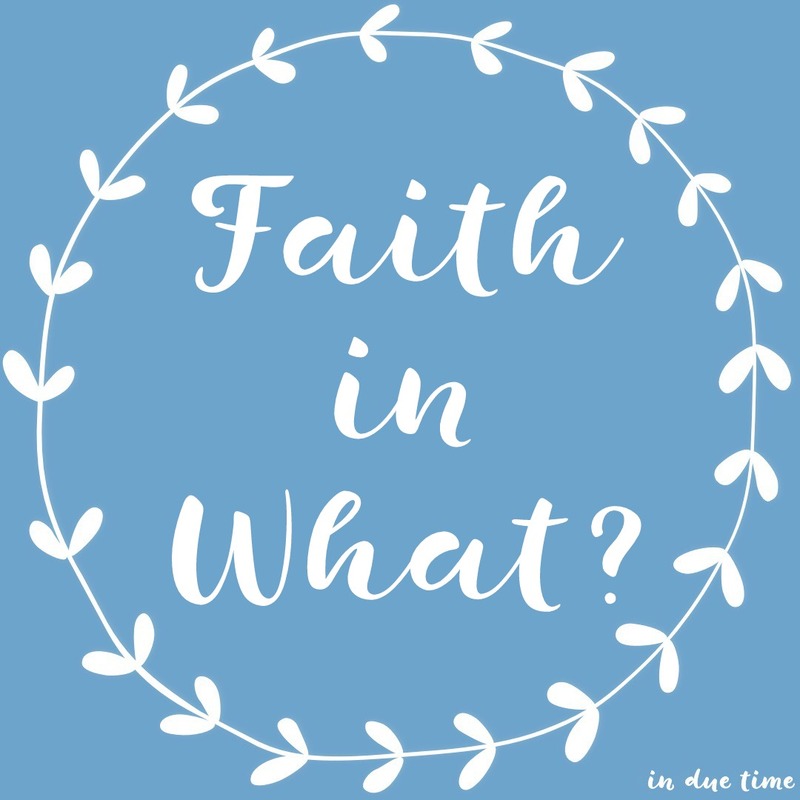 Faith in other people or things will leave you hurting and disappointed, but faith in God? It can change everything. Sometimes I do put my faith and people and end up so disappointed. I need to keep it in God always…easier said than done, but truth! It is only here on earth that we get the chance to develop faith. 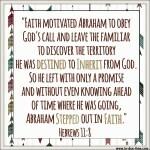 We need to keep our focus on the author and finisher of that faith…. 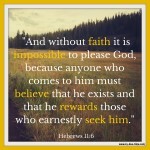 God is the only thing that we can and MUST put our faith in! Dear Caroline, I just wanted to share this with you since I saw your Instagram post about twins: I have been praying that God would bless you and your husband with twins! I have been praying twins for you before I even knew your thoughts about double portion. Isn’t that amazing? God is so good! And twins are awesome. Good one, Caroline! 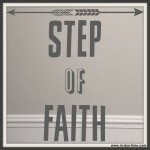 So often we slowly allow our faith to drift to something we are never to have faith in. It may well be a promise we have received from God, but we are to keep our faith in him, not in what is promised. We trust He will keep his promises. But it is our faith In Christ, that allows us to believe that promise will come true. Caroline, I prayed for your babies today and also kept thinking of twins for you. Then I just saw this comment from Susan. I stand in Agreement for twins for you and Colt. Just thought I’d share.